Description: Indian chef is the Indian restaurant to make use authentic spices. Also grilled meat dishes and nan of charcoal-grilled is a good tast. curry is changed to more spicy of your choice, please talk to the staff. the owner and staff is Muslim. we use the meat of HALAL. and also supports vegetarian. please talk to the staff. The restaurant is a 15 mins walk from Yamashina station. We used google to walk to the restaurant but found Raju Bar instead! We found out later that the restaurant is further down the road. We were lucky to be able to immediately found a vacant table since the restaurant is very small with only 5 to 6 tables. We ordered the set lunch consisting of salad, chicken, curry, rice, naan bread & tea. All came in small portion except the naan bread which was big. Taste wise they were delicious and satisfying. We recommend this to others but just be cautioned to not mistaken it for Raju Bar instead! I love the food, the ambience and the hospitality accorded by the owner Mr Raju and his wife. Halal food is not too easy to find in Kyoto, so this was a pleasant find here in Kyoto. Nearest station is the Yamashina Station. I would highly recommend this restaurant. I found Raju near Inari JR line area of Kyoto, near to my hotel. It’s a quiet residential area not commercial. The restaurant is Indian but set up style is half Japanese sit down and half Indian table & chair. The place could make the interiors better for sure; as it really needs a facelift. They play Indian TV and songs, interesting but loud at times. I ordered a Indian platter. 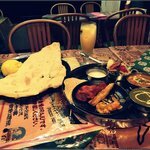 The size of platter was good big and is accompanied with a huge Indian bread and mango lassi ( Indian drink).the food was quality and delicious. They can make it less spicy as per your need. They have a la carte combo available too or separate Indian dishes one can try. Raju has many branches in city and I was told it is popular is the region. If you want to bite into India food Raju is a very good option. The staff is friendly and spoke English/Hindi/Japanese only hope they make the restaurant more new or appealing from inside. thank you for your messege. We glad to could enjoy. We have many branches in kyoto and shiga. staff can speak English and hindi and Japanese.very friendly. If you have any requests, please say feel free. Also we are looking forward to meeting you. We discovered this place on our first trip here in 2004. We've eaten there subsequently in 2008 and 2014. The food here is just fantastic and that staff are very friendly. Even if it's not on the menu, if you know it's traditional name, they'll make it for you...highly recommend! I'm glad to Could enjoy. Also when you come to next time, it makes a lot of things. 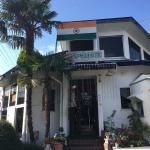 Been to Indian Restaurant Raju, Yamashina Honten? Share your experiences!